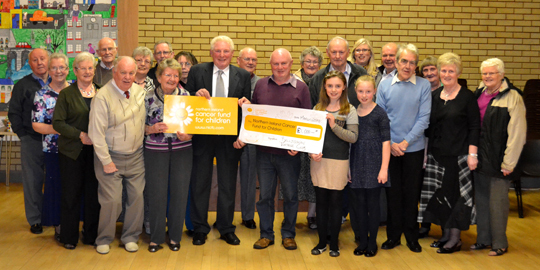 Ballygowan Vintage Club Raise Funds For The Northern Ireland Cancer Fund For Children. Northern Ireland Cancer Fund for Children volunteer, Jonny Hewitt from Ballygowan, is pictured accepting a cheque for £1000 from Chairman of Ballygowan Vintage Club, Trevor Harper, in memory of his late father, Harvey. Included are Anna Wilkinson (NICFC Fundraiser). From left to right: Jonny Hewitt, Ana Wilkinson, Trevor Harper.